Are you thinking about developing an Alexa skill? Think again. Voice assistants, the connected home, and the connected kitchen, are a rapidly growing market. 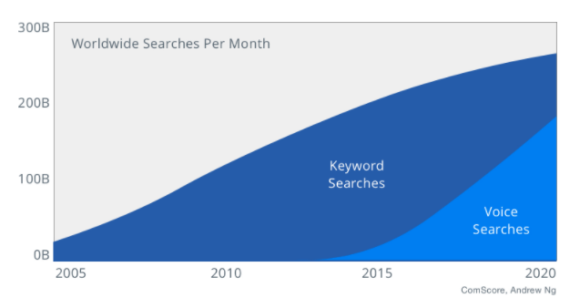 Comscore is predicting that by 2020 50% of all searches will be voice-based. Gartner predicts, also for 2020, that 75% of all US households will be home to at least one AI based voice assistant. This is in addition to those already found on our phones today. The growth rate for Amazon's Alexa and Google's Home devices is breathtaking. 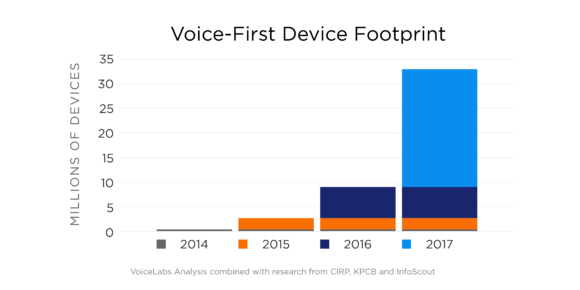 Already, in January 2018, according to Alpine.AI, over 1 Billion internet searches were voice based. Both Amazon and Google reported exceptionally strong sales of AI units during the 2017 holiday period. In our own research, polling the social communities we manage for our Canadian clients, we found an average ownership rate of 20% for voice assistants, with Google Home leading the pack. Another 20% of consumers expressed strong interest in purchasing a unit. Usage examples included recipe weight conversions, voice-based recipe searches, looking for step by step instructions, shopping list creation and streaming music to cook by. As would be expected, numbers were somewhat lower in French Canada. Alexa does not yet speak French and Google Home only started speaking the language in fall 2017. Alexa Skills and Google Actions. What are they and what are the differences? Many of the conversations we're having with clients these days involve planning for the day when consumers expect connecting to brands using voice. The requests we most often receive are for more information about Alexa Skills. An Alexa Skill is the equivalent of an app for a smartphone - software designed to fulfil a specific task. The equivalent for Google Home is called an Action. While they serve similar purposes, there are fundamental differences between the two platforms. This recalls the browser wars of the 1990's when certain functionality was only available to users of a specific browser. Content had often to be changed to work on all platforms. Before making a decision to develop for either platform, it's worth spending time thinking about where and how your data flows. How are consumers using their devices and what are the potential consequences? For example, an Alexa skill, which makes use of Amazon's AI, will have to share a significant amount of data with the AI to work. If a brand is also selling on Amazon, this creates a significant flow of information, information the brand may well prefer to keep confidential. Additionally, many consumers jump from device to device during the buying journey. It may turn out that the ability to carry content from a phone to the voice assistant is important, so might be the ability to play well with all phone operating systems. Flexibility, portability and adaptability are important benefits that we should strive to implement. To achieve the above, we are currently building partnerships with the first voice CMS (content management systems) entering the market. A voice CMS will layer itself over the AI provided by Amazon, Google, Microsoft or any other provider. And while it will use that AI to react to evocation phrases, such as "Hey Google" it will then take over and move the conversation from the host AI to its own system. This keeps both content and user data separate from the host. An additional benefit is that the CMS is typically designed to work with a multitude of host AIs, including those that may not yet exist - think smart appliances, like stoves or fridges. This means that instead of creating custom voice content for each platform, we can now create once, then publish on all platforms - the same way we publish on a traditional CMS, which is accessible to all browser platforms. So before you order up an Amazon Skill or a Google Action, come and talk to us. We may have a better solution.